Did you know medical professionals agree that infants thrive through touch; “wearing” your baby is another way to meet this need. Babywearing is a great practice for keeping baby happy and to help build a stronger bond between mom and her baby. I wore my daughter for 2.5 years. It was just easier. She cried all the time and I had a little guy who needed my attention. I wish there was Abiie’s NEW Huggs Contour when she was younger. It would have made my life much easier. It’s designed specifically to prevent hip dysplasia and give mother’s the comfort they deserve, especially while carrying larger sized babies. It also features six carrying modes! 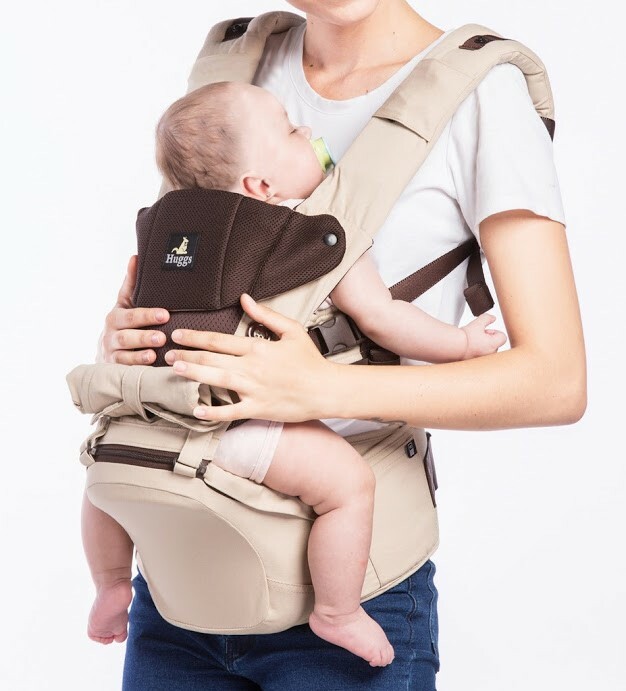 Developed with the assistance of medical professionals, parents, and children; Huggs Contour and its developers are revolutionizing the way your baby is being carried. Hip Seat Technology: There’s nothing more important than the happiness of your child. The carrier booster seat provides all-day comfort, and keeps your baby ergonomically seated in a healthy hip position. Double-layer Center Panel: Easily folding up for added heat, the double layer of the center panel folds down, exposing breathable 3D mesh for fresh air, and also stays dry, keeping your baby comfortable at all times, be it a cool windy evening or a hot summer day. Hands-in Connection: Quick releasing the side buttons allows parents to place a hand inside the center panel, and offers parents an efficient, hands-on proximity to their newborn.